This self-retracting lifeline (SRL) is available in a number of maximum expandable lengths ranging between 2 and 12 m. It comes with a sharp edge-tested strap and is ideal for horizontal applications. Suitable for usage by individuals weighing up to max. 136 kg (incl. equipment). All our self-retracting lifelines (SRL) fitted with a sharp edge-tested strap have been approved for horizontal implementation and are designed to secure your workers from falls in a broad array of applications - ranging from deployment in an overhead system to temporary usage in combination with a pre-installed anchorage point or other anchor system on your roof surface, facade or scaffolding. You can choose from a number of different ABS B-Lock strap self-retracting lifeline models with maximum expandable lengths ranging from between 2 and 12 metres which weigh so little that they can be easily carried along as part of the user’s personal fall arrest equipment kit (PPE) - for spontaneous usage whenever needed. Our larger models can be attached to a roller glider in a traversable lifeline system - without restricting the traversability of the system. Another advantage: The textile strap does not leave any scratches on sensitive surfaces, such as glass or gloss paintwork. Our ABS B-Lock self-retracting lifeline models function similar to a safety belt in your car: The length of the cable or strap is automatically adjusted whilst the user is working - until the maximum length is reached - without getting in the user’s way. If the strap is extended too abruptly - for example, in the case of a fall - the ratchet mechanism inside the self-retracting lifeline casing locks. Our ABS B-Lock devices automatically lock when the rate of extension exceeds 0.5 metres per second. The integrated braking system also doubles up as an energy absorber designed to limit the force exerted on the user’s body in the case of a fall. Depending on the weather conditions and type of application, an ABS B-Lock can reduce the ensuing force to 3-4 kN - significantly below the 6 kN level stipulated in EN 360:2002. 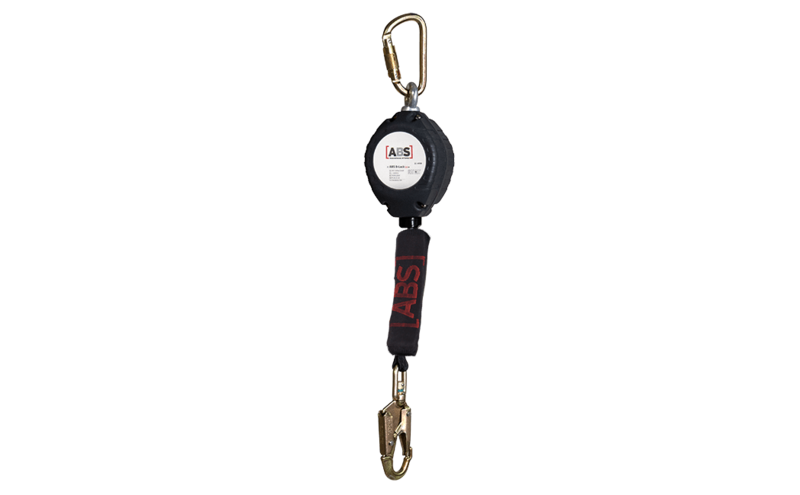 Whatever maximum expandable length you require, choosing an ABS B-Lock self-retracting lifeline is putting your trust in a high-quality device with a number of additional practical features. The strap has a strength rating of 15 kN and is made of a hard-wearing polyamide material with a long life expectancy. At both ends, our ABS B-Lock is fitted with a rotating bracket which prevents the strap from twisting. The fall indicator attached to the carabiner hook indicates whether anyone has already been caught by the device and whether it needs to be serviced. ABS B-Lock self-retracting lifelines are suitable for loads of up to 136 kg (user and equipment) and are protected by a robust synthetic casing.